While many of our greatest storytellers are gone, their stories never die. Sometimes hidden, sometimes lost, but they do live – just waiting to be found and savored. And such is the case of the stories of Elmer Williams, a man who ranks as one of the Toledo’s all time best news storytellers. 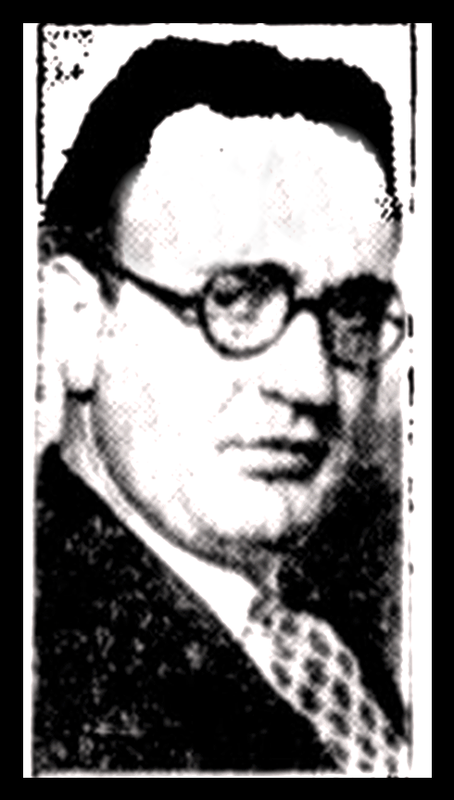 Elmer Williams(pictured here) penned a regular column in the 1920’s and early 1930’s for the Toledo News Bee. While I may call it a column, it was really a portrait – painted with words. Not many words, but just enough to give us a glimpse, or a mood, or a persona that jumped from the page into our heads. In 300 words of less, Elmer possessed the gift of being able to create vivid and powerful images of Toledo’s characters, neighborhoods and the many dark corners of the city that could have been easily overlooked and forgotten. But Williams obviously had an eye for the people and situations that others didn’t see, or chose not to. His talent was a gift. Take a few minutes to read this 1927 homage to an old Toledo firehorse, that had been retired to the streets, pulling a huckster’s wagon. “You aren’t much of a horse. At least you aren’t much of a horse anymore. Let’s see, how much did you cost? The huckster paid $38.75 for you. You with your sunken temples. You with your old eyes. You with your dragging gait, with your drooping head. You, dragging a wagon down the street. A huckster’s wagon full of vegetables. You are a miserable old animal. Maybe sometime long ago somebody loved you. Maybe sometime long ago somebody watched you stepping smartly, and looked on you with warm affection in his eyes. But now – you are a miserable old animal. Maybe that old fireman down the street there, sometimes thinks about horses? Maybe as he passes, staring ahead with his eyes dimmed by many memories – maybe he is remembering horses with proud necks, horses whose temples throbbed at the clang of the bells, whose eyes glared under the stress of excitement. Maybe thinking of a horse that used to pull a clamorous engine from number 1’s. A horse that pulled on the reins, impatiently, feverishly. You miserable old animal, what are you remembering? There was a time when you were the pet of the barns. There was a time when 12 firemen loved to polish your hoofs and comb your mane. There was a time when little fellows stared at you with adoring eyes – little shock-headed fellows with bare feet. Well miserable old animal, there was a time. I can’t help but wonder that if today’s newspapers featured writers with these talents and sensibilities ,in this day and age, perhaps more people would read newspapers. 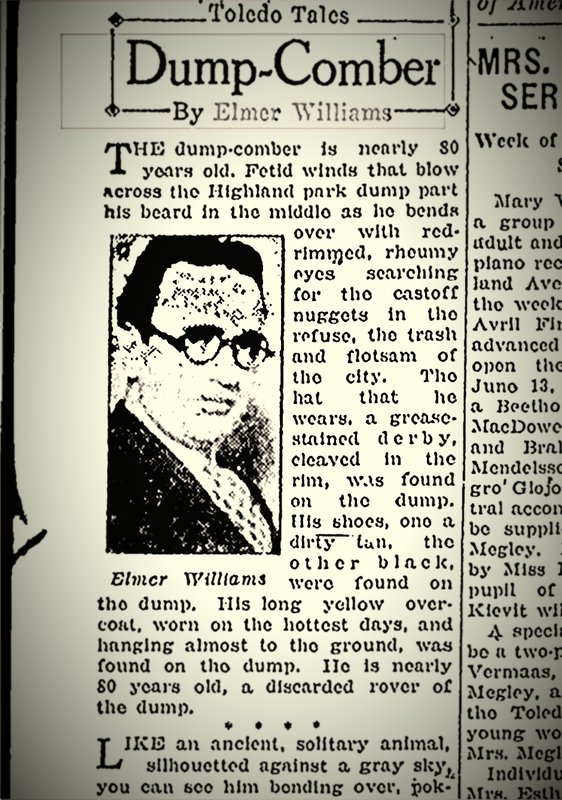 Maybe not, but it’s worth thinking about as we read an excerpt of column by Williams about a man he found combing the city dump at Highland Parkin June of 1927. Sometimes, Williams told stories of entire families suffering the indignities of poverty, and in a style and plot worthy of O’Henry, he exposed the cruel ironies of humanity. Such was the case in this Christmas time story of 1929…that begged for a happy ending. In this pathetic tale, Williams relays the plight of young Allie Mae Whitehead of Toledo who had cooked her brothers’ pet Easter bunny for dinner one night because the family was so poor they had nothing else to eat. Unfortunately, she told her siblings that the poor bunny had gone away to the North Pole to help Santa wrap presents and that he would return after Christmas. She added to her burden of guilt by also telling them that Santa would bring them a toy train this year, but she and her father had no money for such a luxury, nor could they afford a new bunny. Elmer Williams appeared not to follow up on this sad tale, and a subsequent check of future News Bee editions through Christmas week, never revealed whether the Whitehead children ever got a new rabbit or a decent Christmas dinner or any trains as gifts from someone who had taken pity on their dilemma. The news reports of that season in Toledo , however did indicate that many families were suffering from poverty that year, but there was also an abundance of charity for the poor. Reporters , including Williams, seemed to go out of their way to fill the pages of the News Bee with a plethora of poignant holiday tales. In one such story, a 10-year-old boy fell down on Adams Street in downtown Toledo after purchasing a pretty vase for his mother as a yuletide gift for 40 -cents he had saved up for, only to see the vase reduced to pieces by the impact of his fall on the icy sidewalk. It was accompanied by a photo of the boy, sprawled upon the sidewalk amid the shards of his mother’s broken gift. Another story from Williams that Christmas season was about a destitute mother from McCutcheonville in Seneca County who walked with her babies through a blizzard to find shelter and food in Toledo. Williams, also gave his readers, that December of 1929, the portrait of a very old and independent man living in a humble shanty in east Toledo ….A man who would have made a great character worthy of any novel or movie script. “When a man has made his own way in the world for 94 years, neither cold, nor storm, nor hunger can make him unbolt his doors to a visitor called charity. Alone and ill for more than a week, with his hut, almost hidden by the deep drifts of snow, Grandpa Charlie Caulkins refused to reveal his plight. ” am no pauper he had shouted huskily through the door at this unwelcome visitor, “Go away!” His dog, “old Spot” shivering in his corner, raised a proud hoarse bark. But unknown to Grandpa Calkins, the visitor went around to the back door and there he left his offerings, these could not be refused. “Spot” and Grandpa Calkins sat before a fire that cracked in the little stove that crackled in the hut at 2706 Seaman Street. The 94 year old man who has lived alone in that neighborhood for 17 years, drank his coffee talked with the enthusiasm and fluency of a person of 35. This aged face, calm and serene as those seen in old engravings, was unperturbed and resolute. The easygoing conversation revealed a man somehow strangely out of tune with his surroundings. Every change of subject from Grandpa Calkins is like the taking down of one volume after another of American history. He was born in 1836 in an old fort on the Fox River in Illinois. One of his schoolmates was a youngster named Ben Lincoln, a cousin of Abraham Lincoln. Once while riding with his father they saw a long and lean young man in a cornfield taking a nap. When they awakened him , he announced his name was Abe Lincoln and he went to dinner with them. Grandpa Calkins’ conversation spans many periods. He was at Yale, he says, and for years sat at the same table with Uncle Joe Cannon of congressional fame. He is very proud of his lodge pin set with a finely cut ruby. Very naively he assures you this ruby was once in a necklace of Alexander Hamilton’s grandmother. For a man of his age, Grandpa Calkins’ knowledge of men and affairs is astonishing. He seems to know something about everything and everybody, down to the very children of the men and women of his own neighborhood. The famous railroad riots, the Blackhawk War, the civil war, all these things are personal events with him. The first chapter in his book of life is as clear and lively in his memory as these last and later ones. He still delights in making his own way. We can only assume that it was Williams himself who had the coal bin filled so he could work his way into the Grandpa Calkins’ living room and trust. After reading many of his columns, it was easy to see that Williams himself must have been a likeable and unique character in his own right. More than a craftsman of journalism, he was an “artisan and wordsmith” who could see through the mundane and detect the most intriguing slices of humanity. Then knew how to skillfully weave the words to tell their stories. But, sadly, we really don’t know much more about Williams himself. There are no interviews with him, and little documentation about his life in Toledo. I have found through census records, that he was born in Ohio to parents who had emigrated from Wales and that this brilliant writer had only a 9th grade education. His wife Randi was from Toledo and they lived on Wright Avenue in South Toledo and had several children. By 1935 the family moved to Detroit where he apparently took a job as a copy editor for a Detroit newspaper. He remained in the Detroit and died in August of 1969 in Detroit at the age of 72. The end. Wish we knew more, but as I said at the start of this article, Elmer Williams does live on through his words and stories which today are now available online, to read in the archived News Bee editions, accessed through the Google News archive, or in the microfiche files at the Toledo Lucas County Public Library’s local history section. That may be perhaps a bit cumbersome for some to find, but however you access them, the treasure that awaits is certainly worth the effort.